Right as the clock struck midnight on Alfie's second birthday a couple of things happened: He gave up napping, and second, he decided he was too grown up to be pushed in a buggy. That'll have parents everywhere sucking their teeth because if there is a bad combination, it is a two year old who is over tired and unwilling to sit down. We struggled with an answer for a few months until one day I took Keith's never-ending complaints about buggies in London and my love of baby wearing and found an unexpected answer. It's not usual to sling your toddler, mainly because most toddlers would cause their parent's lower backs to file an official complaint with its union, but luckily our boy weighs only a shade more than his sister. Not knowing whether this new venture would be a success we first used a mei tai I made and the weirdest thing happened: when the grumpy little toad was shoehorned into it, he instantly calmed down. Sometimes he even slept. I know! Not one to overlook an opportunity, Keith jumped on the idea that he could now go out without a buggy, and I jumped on the idea of getting the lovely Helen to make us a dream sling. I know, I've told you all this before but I want to build some tension here because I am about to break out the trumpets for a well deserved fanfare. Keith chose the scheme and the fabric, I did the designing, and Helen did the making. These are the teaser shots she posted on Facebook. 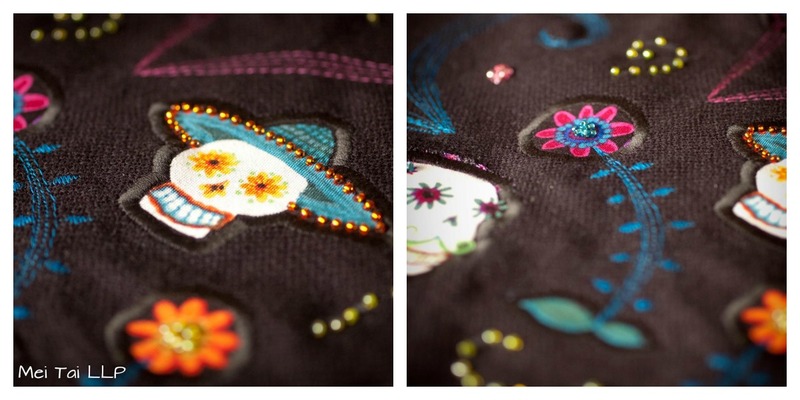 The sling has a whole Day of the Dead theme to it, and I'm not lying here, it is just everything we hoped a sling could be. 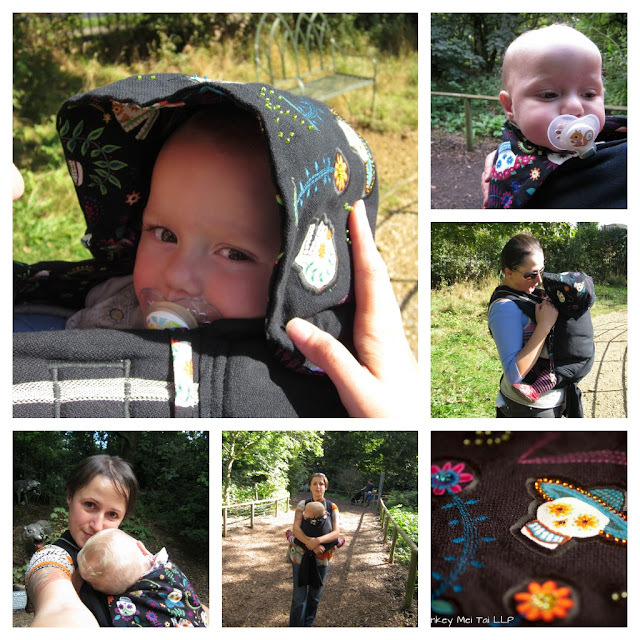 It is super comfy, big enough for the kids (with some growing room), great hood, stunning looks, and it even has a little pouch that slips onto the straps if Keith wants to run out with just a few nappies. Ready for the self indulgent action shots? Happy to oblige!